Metro recently had a picture of a German standing proudly in front of his enormous collection of miniature books. This got me thinking as to whether miniature books were still being collected in the UK as they once were. The market, apparently, has always been driven by fanatical collectors, and in the States forty or more years ago collectors like Arthur Houghton had the funds to dominate the market. 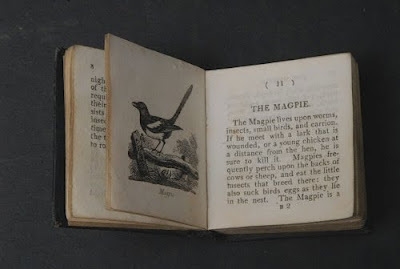 With the death of their owners many collections ended up in large libraries ( like the Lilly ), which meant that the best miniature books were taken out of circulation. There are still collectors around--- and indeed there is a society devoted to the field--but miniature books have become a bit un-cool. They are rarely seen at auction and the number of specialist dealers in the UK has dwindled to a handful. Maybe the trend is growing on the continent--- and it is good to see that someone with modest means in Germany can assemble such a large collection. But is there any point in collecting books whose size is often their most noteworthy feature, and many of which cannot be read without a magnifying glass---or, in two particular cases—a microscope? One man who would have answered yes was the late Louis Bondy, who operated from a shop near the British Museum, where he also dealt in erotica. I recall paying a couple of visits back in the seventies and I remember the place being more especially musty and Dickensian than most second hand shops book shops of that period. Bondy seems to have advertised throughout the nineteen fifties to the eighties, and in 1981 published a book on the subject, which is now a collector’s item itself. 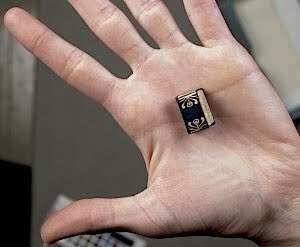 Apparently, the criteria is that a miniature book must be no more than 3 inches tall, which to me is hardly miniature. Most collectors would spurn an otherwise dull book that commanded a premium because it was that unremarkable height, or even slightly smaller. So when there are so many much smaller books around on ABE –although most seem to be boring Victorian or later bibles commanding prices of around $20--I would suggest that unless you’ve got a thing about bibles, you would do well to seek out books of at least 1 – 1 ½ inches high that are interesting in themselves. But don’t expect anything really small to come onto the market. Something like Chekhov’s Chameleon, which at 0.9mm square (about the size of a grain of salt), was, until very recently, the world’s smallest book, until it was trumped by a ‘ book ‘ that can only be read by an scanning electron microscope, are almost always gimmicky. And I suspect that until recently craft technology was unable to come up with anything smaller that a cm high. Many thanks Robin. Collecting miniature books may, as you suggest, be slightly out of favour; there have been very few requests for them at fairs or in the shop. The trend seems to be the other way-- towards gigantic, heavy books. One of the attractions of miniatures is that you can keep a sizeable collection in a shoe box and if you have to move or leave town in a hurry they are eminently portable.